This is no way to treat a gift during the holiday season. Ronda Rousey was given a Gracie Jiu-Jitsu hoodie by Rener and Ryron Gracie this week and she proceeded to shred it – except in a fashionable way. No, really. "Tried to keep the Gracie Jiu-Jitsu logo intact," the UFC women’s bantamweight champion wrote on Instagram. Cutting up clothes is kind of Rousey’s thing. She’s posted multiple pictures on social media of her taking normal, every day garb and turning it into her own rather holey style. The 26-year-old has already crossed over into movies – she filmed "Fast & Furious 7" and "The Expendables 3" before starting training camp for her UFC 168 title fight against hated rival Miesha Tate on Dec. 28. Is it only a matter of time before Rousey her own clothing line? Rowdy Threads has a nice ring to it. Send royalties this way, Ronda. By the way, Rener was a good sport about Rousey turning his hoodie into Swiss cheese. Rousey hung out at the Gracie Academy in Torrance, Calif., this week and did some rolling. Not a bad place to keep your grappling sharp, even for someone who makes a living submitting people. 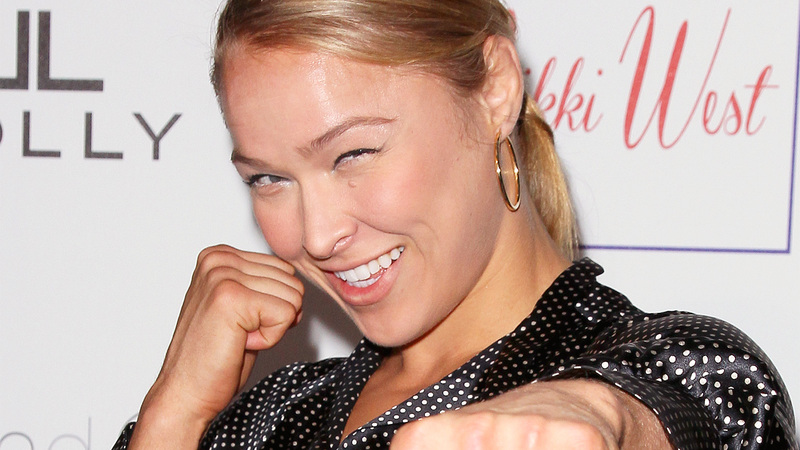 Ronda might owe Rener and Ryron an invitation to a couple of movie premieres in 2014. Just saying.